I dropped into the shops to get Tweenie a shirt with a collar for a camp, and thought I’d grab something for dinner, being that I was completely unprepared for the evening. Did I want chicken? Pasta? Steak? What do you do when you can’t make up your mind? Why, you ask your children what do they want for dinner! Nuggets and chips, came the hopeful reply. No. Kingsleys chicken and chips? No. Hamburgers? Yes, that’ll do. Wandering around the supermarket when hungry is the worst possible thing to do for your wallet. I bought beef ribs. That’s ok, I have friends coming for dinner on Friday night, slow cooked beef ribs for dinner. I bought a pork shoulder, good, that’s pulled pork for dinner on the weekend. 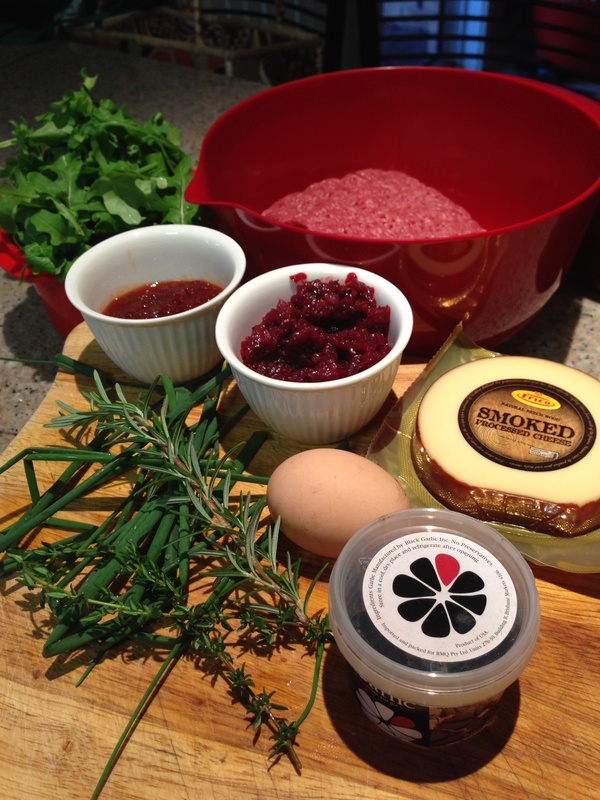 Beef mince, rocket, black garlic and a smoked cheese also go into my trolley. 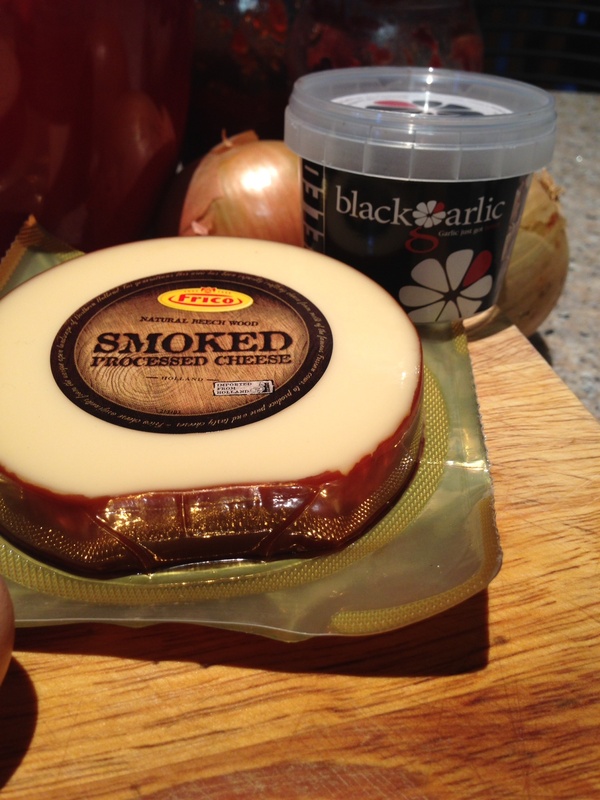 Black garlic and a smoked cheese? Why? Why? Why? Well, I’d been eyeing off the black garlic every time I was in the garlic aisle. And it was cheap at $3.98, so why not? The cheese was on special, and I like things on special. Checkout, swipe it all through and the garlic isn’t $3.98, it’s $7.98!!! Whatever. I chuck it in the bag and head off home. I’m sure it’ll be worth it. 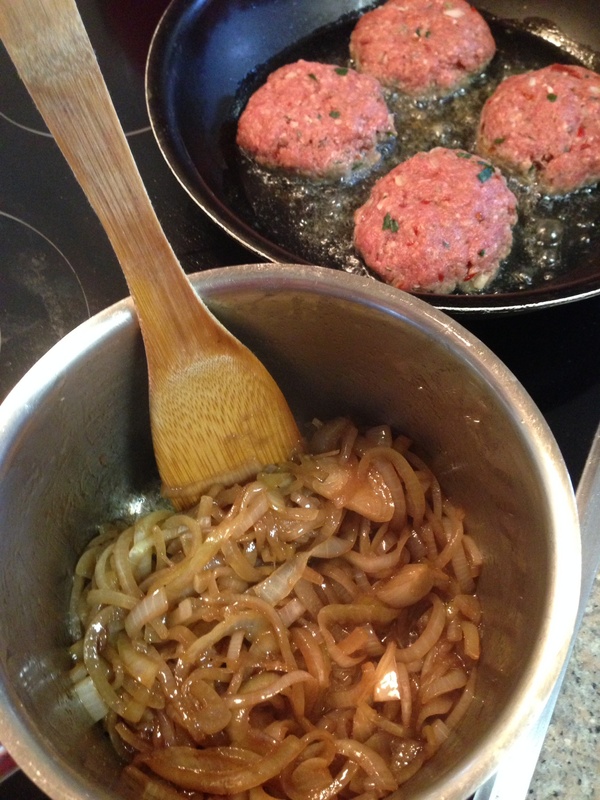 I started prepping the burgers, and was thinking about what to do with the two odd ingredients. 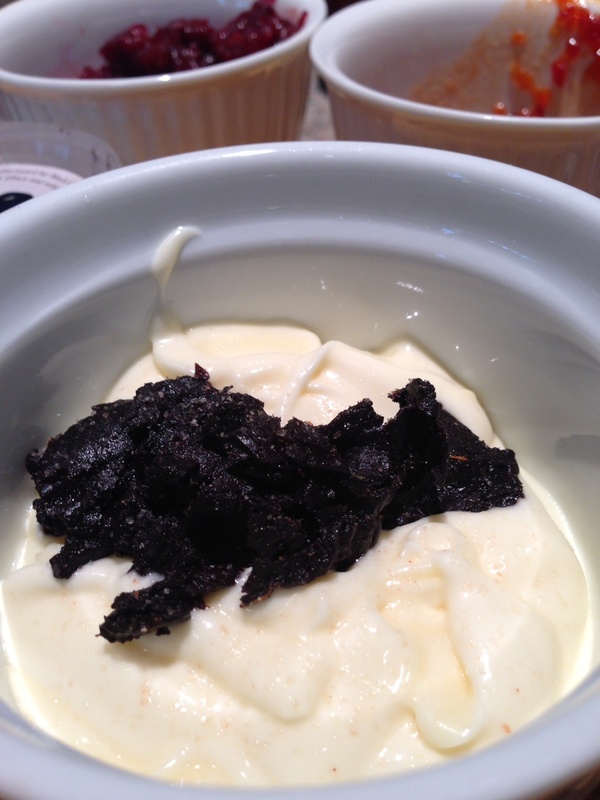 Black garlic mayo and melted smokey cheese on the burgers, lets see if that works. And yes, yes it did. Surprisingly. Mix all the ingredients together, and use your hands! It’s the best way to do it. Form hamburgers and let them sit, til you’re ready to cook them. 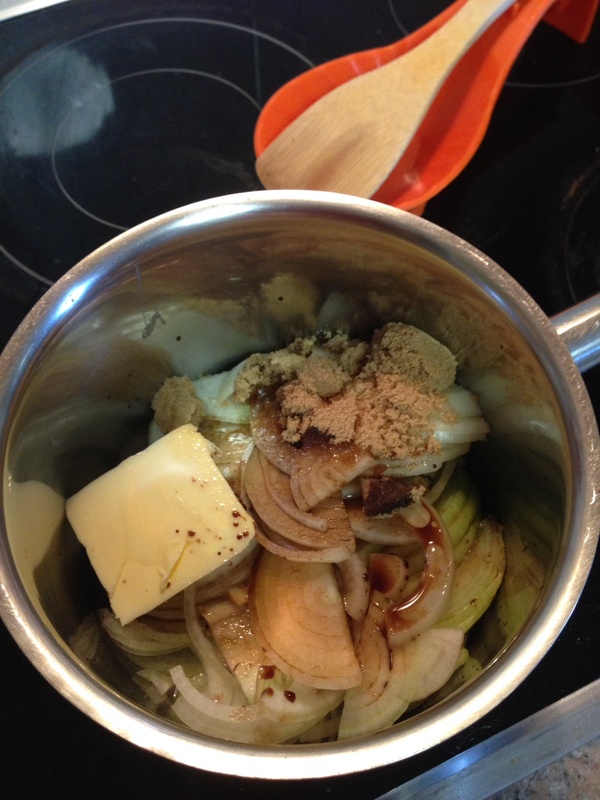 in the meantime, caramelise some onions – a couple of onions, sliced, a dollop of butter and oil, a splash of balsamic vinegar, a spoonful of brown sugar, salt and pepper. Cook down slowly til nice and sticky, sweet and savoury. 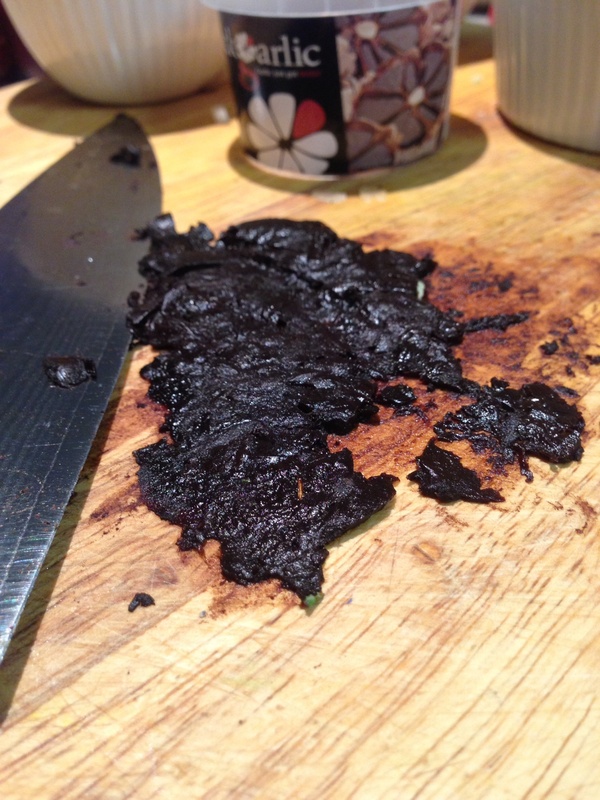 Have you tried black garlic before? It’s a little odd. 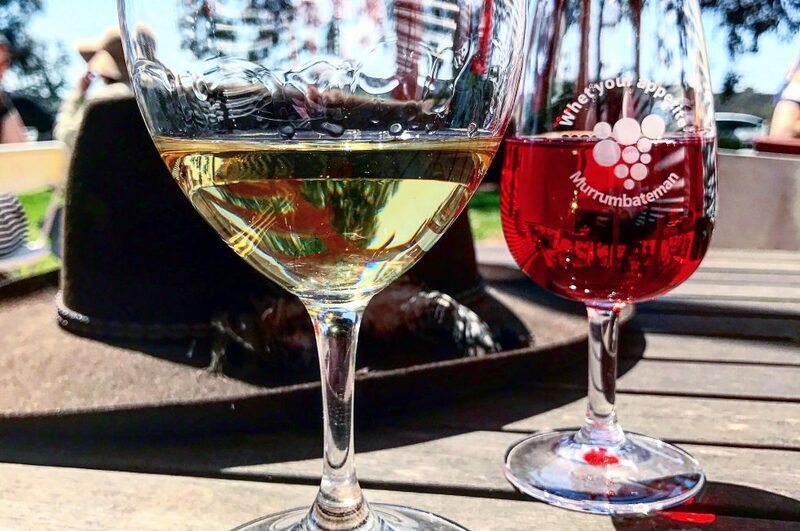 It’s sweet, sticky, tangy and a little sour. It hasn’t got a lot of a garlic hit, and you can’t smell it too much either. I crushed it on the board with the back of my knife, then added it to some whole egg mayo. I can’t wait to try it on a warmed up leftover burger tomorrow at work to see if the garlic wafts through the office. 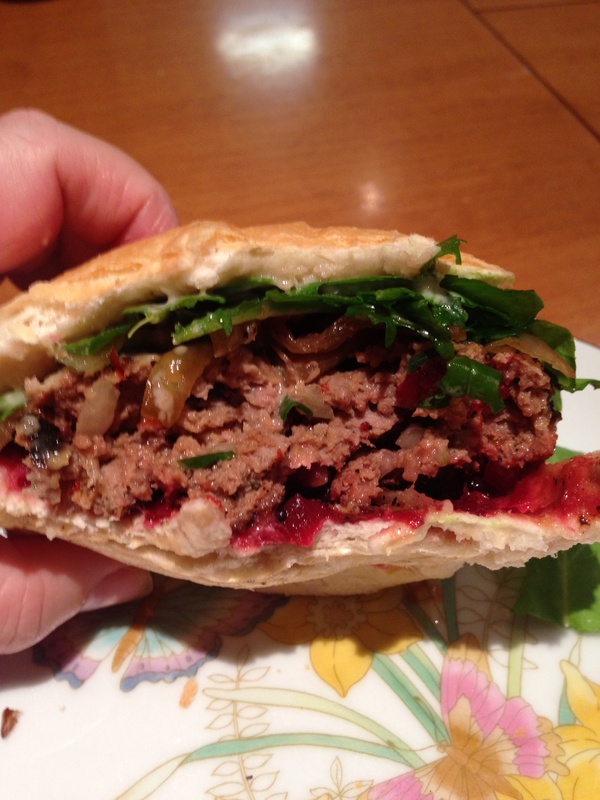 Cook the burgers to your liking, and let them rest for a couple of minutes. 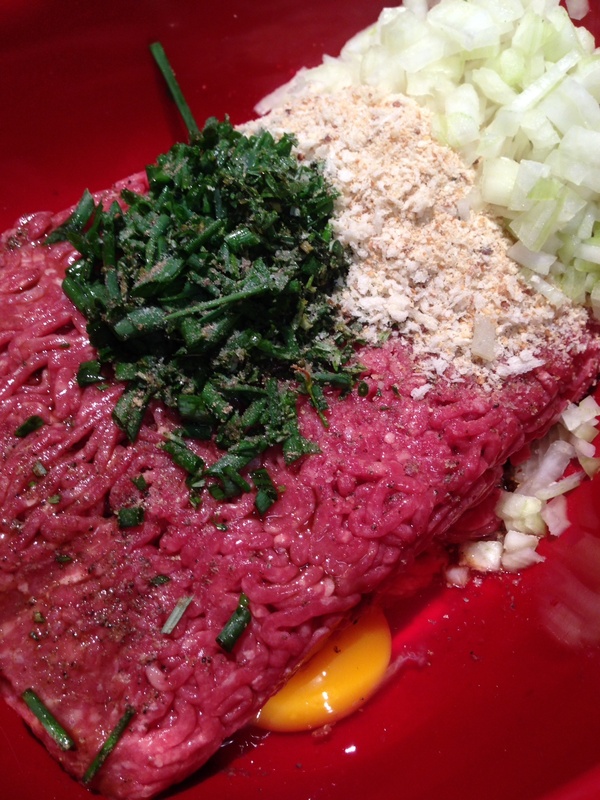 This is where I added the smoked cheese, grated onto the hot burgers so it melted a little. 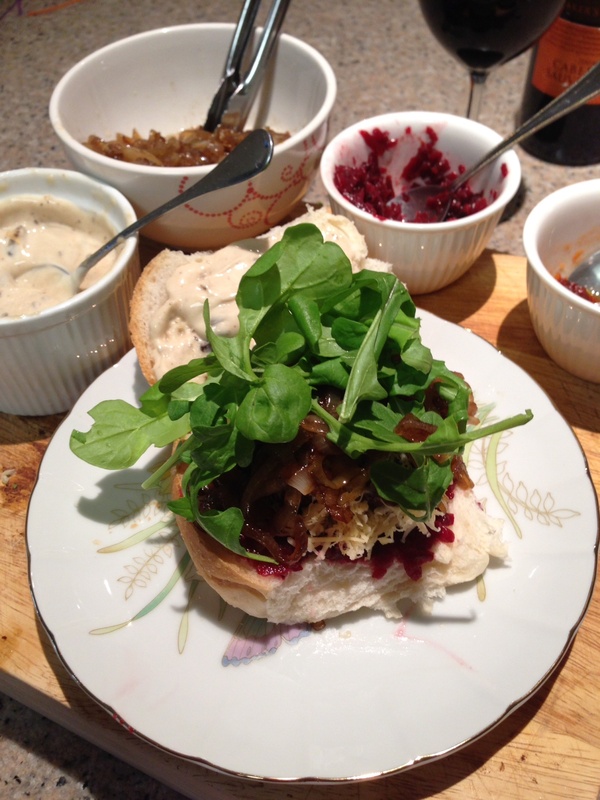 I added these things to my burgers, and they were, well, delicious – rocket, garlic mayo, my beetroot relish, caramelised onions, smoked cheese. On a fresh white bun. Yum. 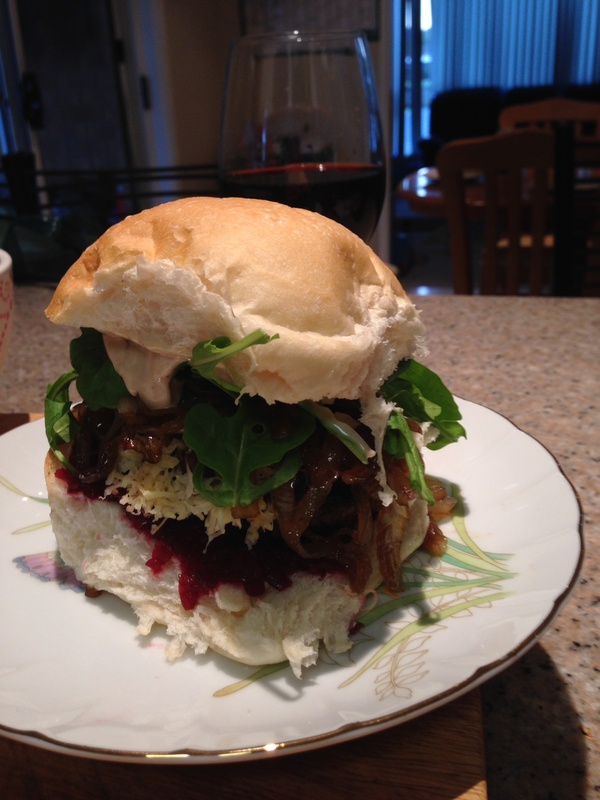 Better than bought burgers and it only took me 40 minutes from packet to table. I think I’ll pick up the odd ingredient the next time shopping too. Next Post A double decker salted caramel mudcake for a birthday. It was. And, even better are the leftovers for lunch today. A collard shirt eh? Is that a shirt made from collard greens? Must be very tasty!! What a delicious looking burger! I do like black garlic 🙂 And I’m having friends over on Saturday night and we’re having slow cooked beef ribs too! 😀 Tis the season with this rainy weather I think! I’ve got my ribs marinating as we speak. Red wine ribs, these ones are. So looking forward to them, with stacks of mashed potatoes and another bottle of red!